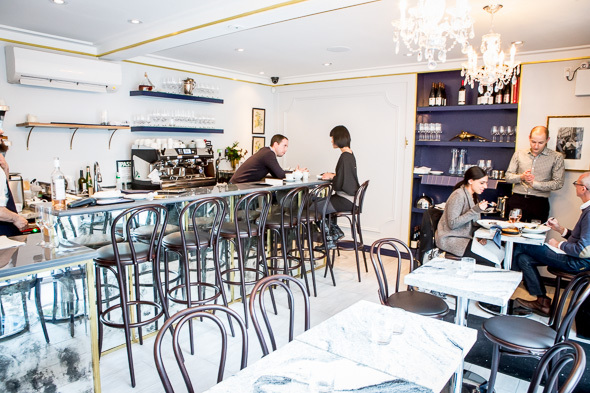 Chabrol is a charming, tiny boîte tucked away down a laneway on Yorkville Avenue. Previously Le Trou Normand , the French restaurant legacy continues here, this time with a focus on the south of France. Cava co-owners Doug Penfold and Niall McCotter were originally asked only to consult on the space for their friends, who own the adjoining clothing store La Boutique Noire , with the intention of turning it into a cafe. They weren't expecting to open their next restaurant here, but couldn't resist when they saw it. "We fell in love with the joint," admits McCotter, who runs the management side of things. "It was very unplanned, very organic." 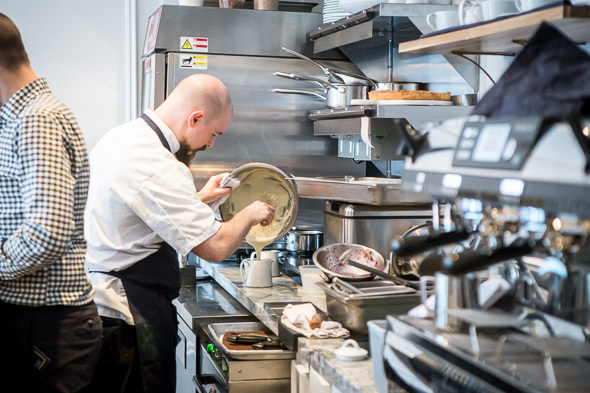 Although Cava is Spanish-influenced, chef Penfold ( Canoe , Pastis , Didier ) is classically trained in French cuisine and has always wanted to have a restaurant with dishes inspired by the south of France. Penfold even kept a name for it handy; he'd always liked the term " faire chabròl ," the southern French custom of adding red wine to the dregs of a bowl of soup and then drinking from the bowl directly. With the passing of his mentor, chef Claude Bouillet, in 2014, Penfold wanted to pay tribute to him with this place. A simple and elegant, yet relaxed space with floor-to-ceiling windows that let in a ton of natural light during the day, this is also quite a cozy spot. Its marble-topped tables seat a total of 10 inside (hint: make reservations) and just nine more seats around the open kitchen/bar are saved for walk-ins. In warmer weather, the front patio will up the seat count significantly. An all-day menu features elevated classic French comfort food, and sommelier Christopher Madej ( Auberge du Pommier ) has assembled a carefully curated list of mostly French wines to accompany lunch, cinq Ã sept or dinner. 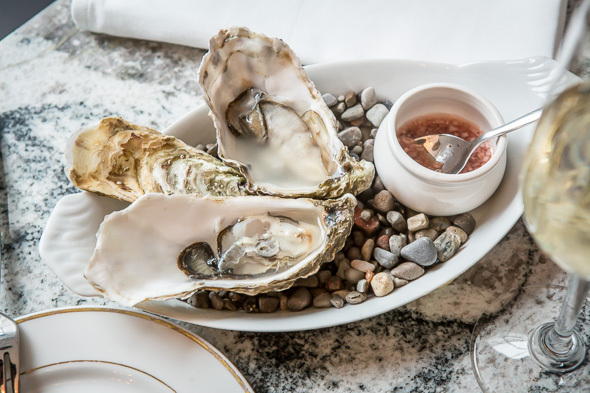 We start with oysters on the half shell (MP) served with a mignonette. They're British ones I've never tried before - Jersey Rocks sourced from across the coast of Normandy - and they taste briny and fresh. 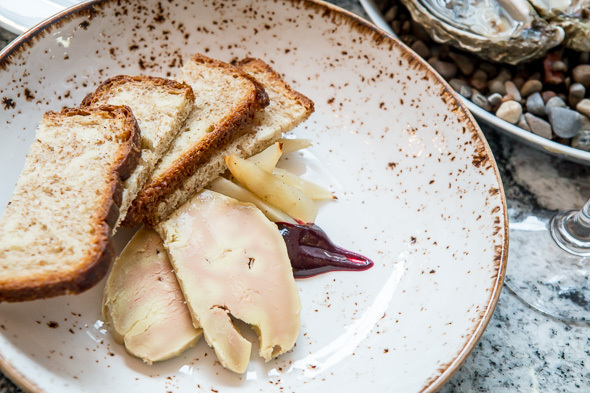 Oysters are followed up by decadent Riesling-poached foie gras with black currant and salsify ($19). This decadent treat is accompanied by slices of pullman loaf, and it blows my mind to learn that everything is made in this small open kitchen, including the baked bread. Penfold is passionate about the old-school skills of making everything from scratch, and he's eager to pass down that knowledge so that it doesn't die out. 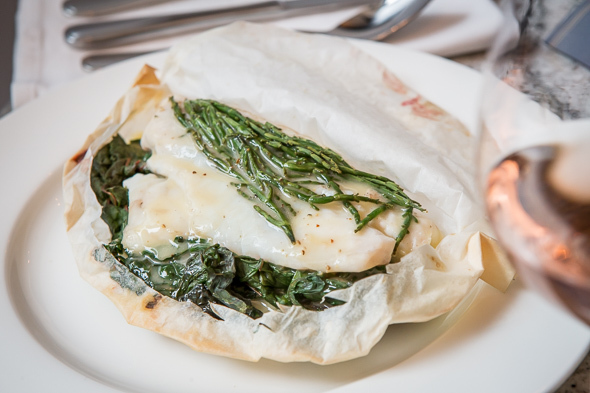 Papillote of whitefish ($28) is lovely in its simplicity; the tender, delicate fish, which comes from John Bil of Honest Weight , is steamed in parchment paper with sea asparagus, leeks and Swiss chard. The half-moon package is then cut open tableside, where a rich Vermouth beurre blanc is poured over it. It's so tasty that I wish I could swim in the stuff. 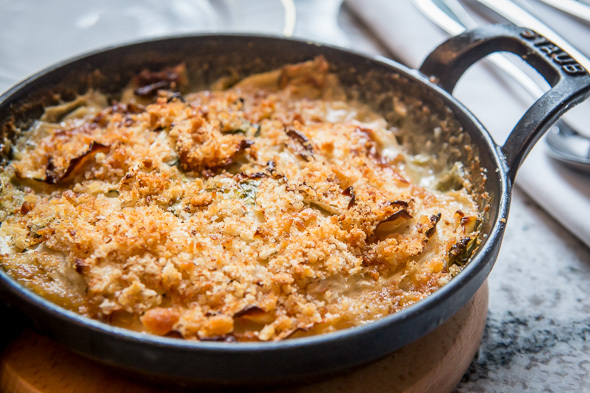 My personal favourite, however, is the escarole and celery root gratin ($12) topped with bread crumbs. It's full of flavour and texture, both creamy and crunchy, and a soul-warming kind of delicious. If you're willing to wait 20 minutes for dessert (or order in advance), get the apple tarte ($13). 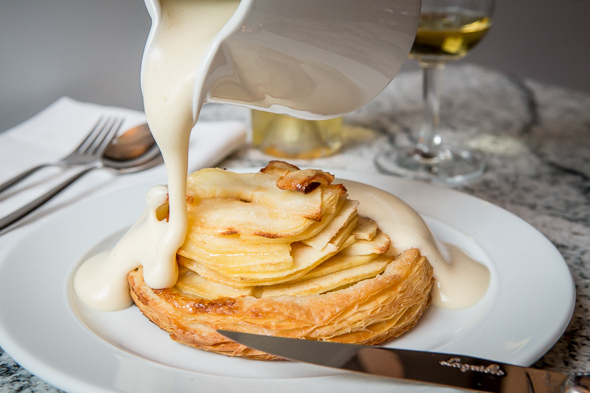 Of course, the puff pastry is made in house, and the Calvados sabayon poured tableside over the just-baked tarte is whisked Ã la minute. I'm told the light and airy sauce contains apple brandy as a nod to the previous restaurant's name (" le trou normand " refers to taking a shot of Calvados between two courses). The diners next to us eye our tarte enviously, which is completely understandable. It's just one of those desserts that everybody has to have once they see someone else with it. This is clearly a passion project for Penfold and McCotter, and it's obvious they both love what they do. They've created an atmosphere (likely due to the tight seating) that encourages social interactions between strangers, and they tell me some nights it's like a party in here. 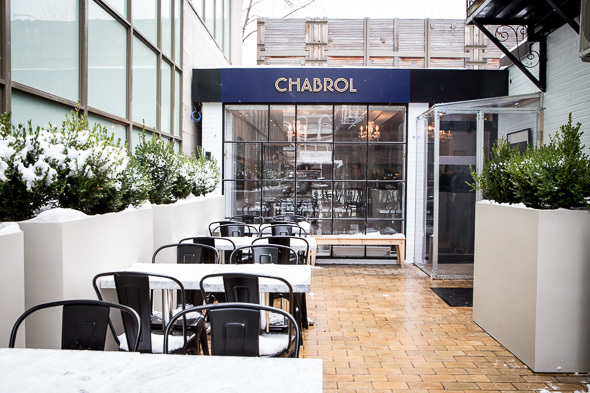 It might be difficult to score a seat for dinner, but Chabrol is also an ideal spot for lunch or a daytime break (hello, wine and cheese) should you find yourself in Yorkville.